You are now about to witness the strength of street knowledge. You may recognize that as the opening line to the N.W.A classic “F*** The Police.” The drum break that follows is one of the most famous and most used drum breaks in recorded history. Lifted from “Amen, Brother” by The Winstons, the seconds worth of audio spawned genres and is still a regularly used drum break sample today. The ‘Amen Break’ and ‘Funky Drummer’ are getting tired though. It is time we producers invested in new drum breaks to help lift our productions and keep the beat grooving. This article will explore some of the best drum breaks available on the market today. 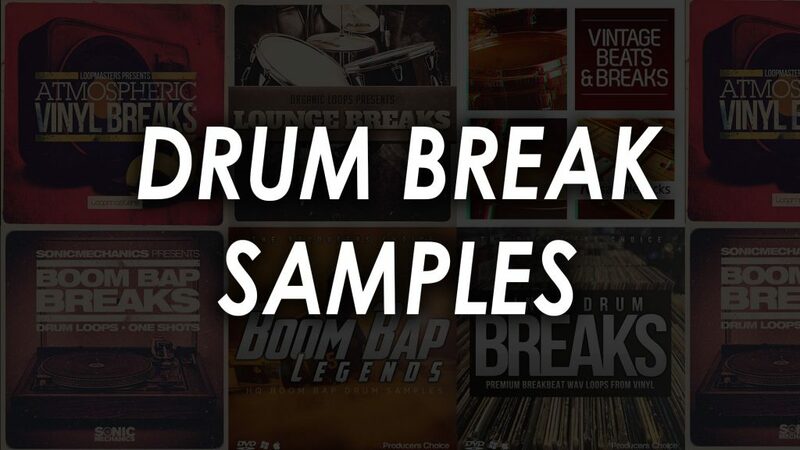 Below is a short list of the drum break samples we talk about in this article. Scroll down for more details or click for audio demos. The Loop Loft has an interesting take on Hip Hop drums. Packages explored throughout this article revolve around the analog vibe from ripping vinyl or using analog drum machines and samplers. 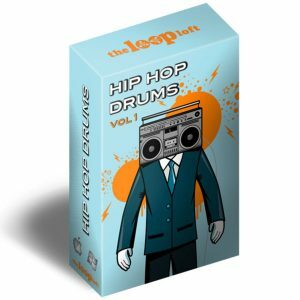 Hip Hop Drums Vol 1 from The Loop Loft take Hip Hop drums back to where they started – Live! It is common knowledge that Dr. Dre is a lover of vinyl digging and sampling. However, it is also common knowledge that the power from his breaks comes from having a drummer rerecord the samples he likes. There is something irreplaceable about a live drummer grooving. This collection contains 274 loops and 72 individual samples. Inspired by Jay-Z, Kanye West, The Beastie Boys and more, this collection is ideal for anybody looking to upgrade their current Hip Hop drum collection. Each session of grooves comes with a multitude of beat variations, as well as many fills. This is a real phat collection, available in WAV, Stylus RMX, REX2 and AIFF formats. Drag and drop a loop into your Digital Audio Workstation and find your inspiration. Whether it’s Parliament-esque Funk drums you want to add, a glitchy snare or a booming 808, this pack has you covered. Drop the individual one-shots into your favorite software sampler and reinforce your breaks with extra sounds. If you are craving the sound and feel of a human, and less so a machine, this is the pack for you. Deep-pocketed, hypnotizing live drum grooves are key to a powerful drum break. 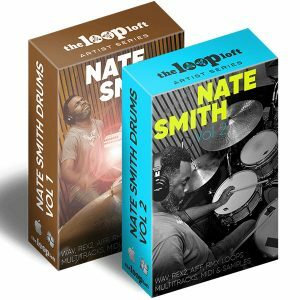 Nate Smith Drums Bundle from The Loop Loft is a collection 541 grooves, fills and breaks, performed by versatile drummer Nate Smith. With his roots in funk and jazz drumming, you can be sure that the pocket on these grooves has a similar vibe to the classic breaks you have heard sampled over and over again. This is a high-quality collection of samples. Recorded at one of New York City’s top studios through a vintage Neve console, you can be sure that each sample, loop, and break is vibrant, crisp and punchy. This collection offers a massive variety of tempos, beats, and genres, to help match the perfect drum break to your track. As well as this incredible flexibility, the Deluxe Edition tracks have been recorded at a sterling 96 kHz / 24 bit. The Deluxe Edition of this pack provides 12 separate channels of audio for each microphone. This allows an enormous amount of flexibility over the final balance of each break. Need more snare? No problem! Turn up the individual channel. Want your break to sound big and ambient in a drums only section? No problem! Just use the room mics provided! As well as having access to one of the grooviest drummers, each pack comes with MIDI files. These MIDI files allow you to take the best of Nate’s grooves, re-sequence to suit your track and re-trigger using your Virtual Drums of choice. A fantastic addition to an already vast library. 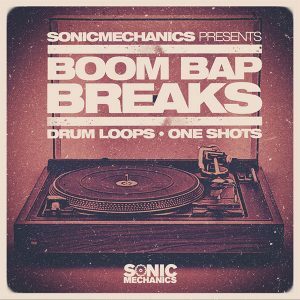 Boom Bap Breaks from Sonic Mechanics is a collection of old-school beats, looped up and ready to inject into your latest production. This pack is 145 loops ranging between 80 – 120bpm, covering Hip-Hop, Trap and more down-tempo Electronic Dance Music. Each loop is REX2 compatible, making splicing and stretching a breeze. A series of one-shots and sampler patches have also been included as part of this collection. Having access to the individual components of a break allows an incredible amount of flexibility. This lets the producer to take the groove in whichever direction they wish. The sampler patches for EXS24, Halion & Kontakt are particular gems for enabling finer sequencing of each break. Within the collection, there are pre-processed breaks with an old-school, crunchy vibe. The kicks are heavy, and snares are crusty. The processing is so authentic to the late 80’s / early 90’s Hip-Hop and Drum n Bass that they can be dragged, dropped and left alone. A mixture of live loops, synthesizer layers and percussion has been layered with these breaks to add weight and color. Also included are the original clean loops, so if you prefer crafting the tone and vibe yourself, opt for the clean loops. This collection is ideal for producers both searching for that authentic vibe, but also want the flexibility of taking the breaks in the direction they see best. Fetishizing over vinyl is easy. It looks good, it smells good, it sounds good. Yet, those more seasoned producers are no doubt glad they are no longer straining their backs, hunched over crates all day to find the perfect sample! 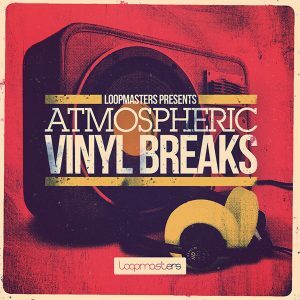 Loopmasters present Atmospheric Vinyl Break, all the tonal loveliness we so often desire from vinyl, without the inconvenience! This pack contains 30 new breaks, plus the individual parts AND bonus drum hits from leading break producer, Chemo. As well as the breaks and one-shots, this collection also contains 35 software sampler patches for NNXT, Halion, SFZ, Kontakt, and EXS24. If you are looking to add that vinyl aesthetic to your drum breaks, this pack is perfect for you. A blend of live and synthetic drums and percussion layered with the crackle of vinyl, atmosphere, and ambient layers. These samples will breathe new life into your beats. Perfect for Hip Hop, Trip Hop, Trap, Urban, Breakbeat, Chillout, Electronic and more. These breaks capture a variety of vibes from live shuffling, to gritty, to live played experimental breaks and dark and moody beats. Whatever vibe you need, you will find it in this pack. Whether you are wanting to drag and drop breaks or sequence them yourself using MIDI, all is possible with Atmospheric Vinyl Breaks. 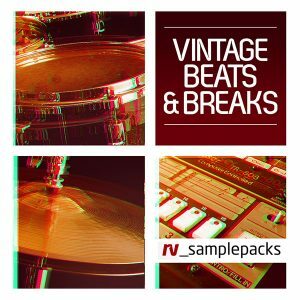 If you are after a collection of old-school live and electronic drum loops and hits, look no further than RV Sample Packs Vintage Beats & Break. This pack covers everything from vintage live drum breaks; ala the Amen break, to classic 808 breaks, covering the full range of early Hip-Hop. This pack contains over 100 individual hits and a whopping 1000 drum loops! These include live drum loops, 808 drum loops, sequenced loops and percussive loops. The loops have been influenced by Led Zeppelin, James Brown, Afrika Bambaataa and The Chemical Brothers. The recording process for this collection has included equipment as lo-fi as a cassette to studio-grade tape, capturing all the vintage warmth of those classic breaks. The live drum loops have used different recording locations and techniques to provide you with a range of sonic signatures to choose from. All loops are REX2 formatted, allowing you to stretch and splice as much as you desire. As well as drum loops and one-shots, there are many percussion loops for extra groove, rolls and fills for transitional effects and FX to milk the impact of your breaks. We’re particularly fond of the way RV Sample Packs have recreated the feel of some of our favorite breaks. Try experimenting with layering many types of break. A live drum break layered with an 808 break; sliced and sequenced to match, can have all the vibe of a vintage hip-hop record, but slam in the club with a more modern trap style 808 attack. If hammering MPC styled pads to craft a break is more your style, they have got you covered. 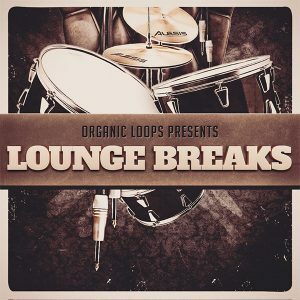 Lounge Breaks by Organic Loops is a collection of sharp, live drum samples. Captured in stunning high quality 24 bit, this pack is perfect for anybody in the market for a professional set of live recorded breaks! A fantastic addition of inspirational breaks for Downtempo, Hip-Hop, and Chillout. Each folder within the collection has been broken down with a range of different recording techniques and treatments applied. Within this kit, you will find a variety of breaks from clean, crisp drum loops to the more processed loops. Unlike other collections, this pack holds back, with no breaks being processed to death. This allows you to stamp your sonic signature onto any loop. Lounge Breaks is divided into 4 tempos, 85, 90, 100 and 115bpm. Although the tempos are defined, each break is REX2 formatted and can be chopped and changed to your hearts content. Each loop has been played by a live drummer, allowing you to add a human feel to your productions. Whether you’re wanting something snapping on the beat, or a looser shuffle groove, there’s a break in this collection to suit your needs. As well as the 275 loops, there are also 55 one-shots and 5 software sampler patches. Dive into sound design by supplementing your favorite loop with some of the more experimental and processed one-shots. Load up NNXT, Halion, SFZ, Kontakt or EXS24 and manipulate MIDI to create your perfect break. Whatever it is you desire from a drum break collection; Lounge Breaks is an inspiring collection of filthy grooves that belongs on every producer’s hard drive. Well then, there we are. An article dedicated to the hottest drum breaks available on the market today. As fun as it can be to rake through crates, listening to records to find the perfect section and sampling into your Digital Audio Workstation, it is getting more difficult. James Brown’s “Funky Drummer”; heard on countless records from Public Enemy to George Michael, is a 50-year-old song. Tracking down an authentic vinyl copy in any condition to be sampled is going to be difficult. If you are sick of the somewhat cliché, tired breaks you hear on EVERYTHING, there is a host of packs above full of new grooves to help reignite your inspirational flame. The range of sonic signatures available is something to be noted, also. I am impressed by Hip Hop Drum Breaks Bundle in the way they have collated the classic drum breaks, so you don’t have to. Although they may be seen as tired a lot of the time, it is important to pay homage to the greats. You might get inspired by the Amen Break, or find a new way of treating an old classic. I am impressed by the range of live drums available as I believe a human grooving in Hip Hop is something that made the genre so great in the ‘Golden Era’ and needs to return. Regardless of what genre you work in, there are many situations in which you will find yourself wanting a drum break. As always, visit the product websites for more details.s above and listen for what the breaks are, but also how they could be.